Guaranteed to leave skidmarks on your driveway and a smile on your child�s face. 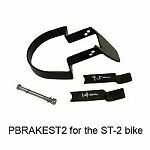 This model brake fits the ST-2 Strider. How do I know which model of Strider I own?